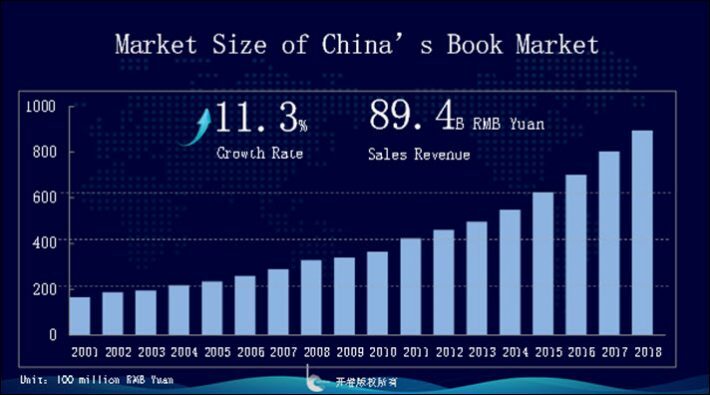 In 2018, the value of China’s retail book market reached 89.4 billion yuan (US$13.2 billion), according to Beijing’s OpenBook research. That revenue is based on units sold at list price and may not reflect discounted sales. In that light, 2018 saw an increase in the overall book market’s value of 11.3 percent over that of 2017. Online bookselling continues to grow in China, in 2018 at a rate of 24.7 percent. That growth rate, however, shows a mild slowdown, according to OpenBook, and a valuation in online sales of some 57.3 billion yuan (US$79.1 billion). 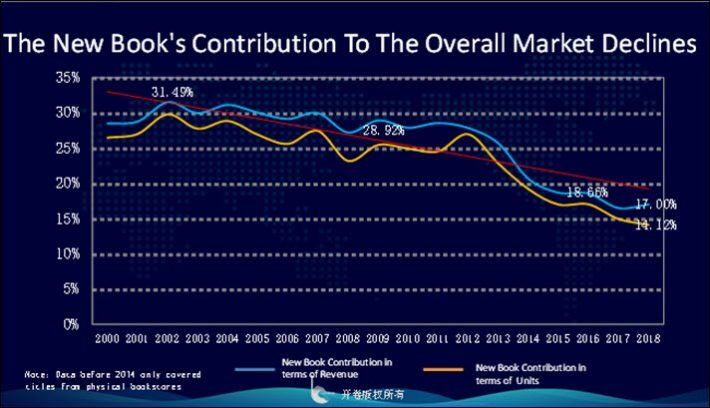 By contrast, OpenBook reports, physical bookstores in China reported an aggregate negative growth rate, down 6.69 percent in 2018 over 2017. 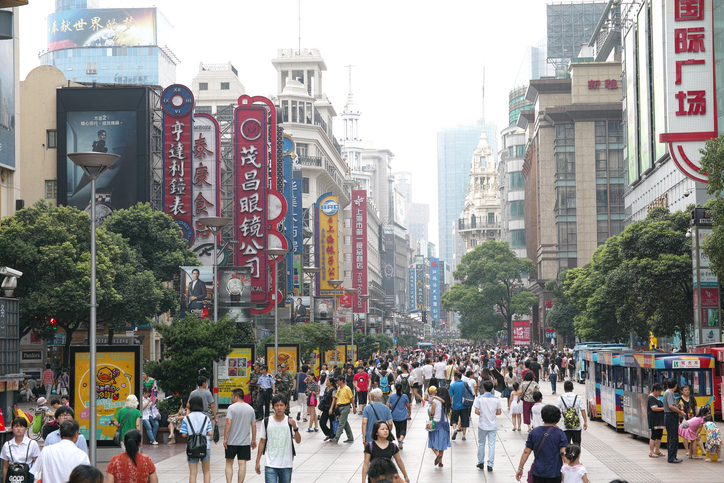 Sales in physical stores reached some 32.1 billion yuan (US$4.8 billion). 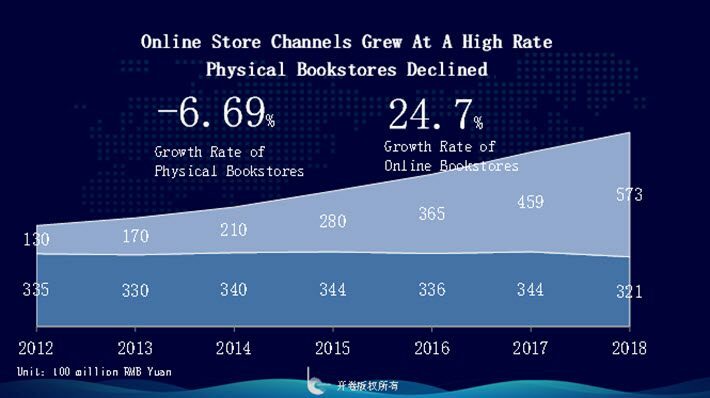 The online bookstore channel in China, according to researchers at OpenBook, began to build its place in the Chinese market in 2008 and has moved rapidly, gaining at more than 20 percent annually. The speed of online retail’s movement in the market is attributed largely to price discounts which may average as much as 38 percent off list pricing. As Publishing Perspectives reported in our coverage of the OpenBook “Reading X” conference held in Beijing earlier this month, the company saw 156,000 new trade books released in 2018. 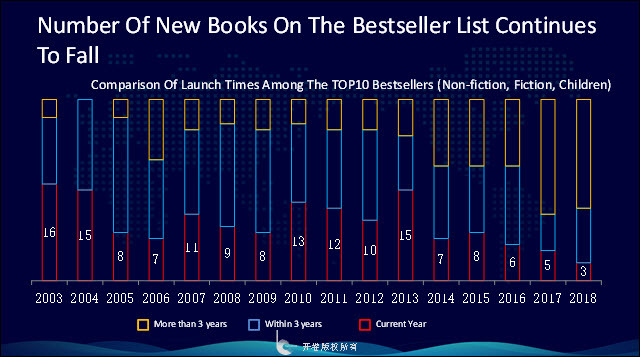 This reflects a trend in which backlist has become steadily more important in China, with a corresponding decline in new-title publication. OpenBook tells us for our report today (January 21) that new book production was first detected to be falling below 30 percent of market action in 2008, and by 2015 new books’ publication had dropped to below 20 percent of sales. This is frequently reflected in our reportage of China’s bestsellers. (Our December 2018 bestseller charts are below.) Both in our overall and foreign-author charts and in fiction and nonfiction, classic titles are firmly entrenched in the interests of Chinese readers, and even relatively contemporary work can stay on charts for years once is popularity is established. Reissued titles are a mainstay of the lists, as well. In this sense, China’s market is rather slow moving: while its overall growth is robust, favored titles really latch onto the charts and show enormous tenacity among consumers. And in an interesting note, OpenBook’s staffers say they’ve discerned a mounting resistance to new titles in the Top-10 space. In 2015, eight titles of the Top 10 were new. In 2018 only three titles in the Top 10 were new, and of those, two were nonfiction (Liang Jia He and You Bad by DaBing) and one was a children’s book. This means that no new adult fiction entered the Top 10 bestseller list in China in 2018. Yang HongYing remains the bestselling author for 2018 in China. 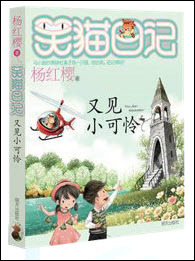 Since 2000, Yang HongYing ‘s works have become bestselling children’s books, including titles from the writer’s campus novels series, the “Naughty Boy Ma Xiaotiao” series, and the “Diary Of A Smiling Cat” series. Japan’s Higashino Keigo remains far and away the bestselling author of fiction books in 2018. He has 12 titles listed on the annual fiction bestselling Top 100. The nonfiction author of 2018 was by Da Bing. Since 2014, he has published a new title every year. Each one went into the Top 30 of the fiction bestseller within a month of publication. Among new writers spotted in 2018, OpenBook recommends keeping an eye on a nonfiction writing group known as the TF Boys. Below, then, are OpenBook’s overall lists from (month) of bestsellers in fiction and nonfiction, followed by its lists of bestselling fiction and nonfiction in China by authors from outside the country. At the end of our article, as always, you’ll find notes on how the lists are constructed. 7 7 9787544270878 2014-04 Miracles of the Namiya General Store Higashino Keigo Nan Hai Publishing Co.
9 11 9787544291170 2017-08 One Hundred Years of Solitude (50th Anniversary Edition) Gabriel García Márquez Nan Hai Publishing Co.
12 13 9787544277617 2015-06 Love in the Time of Cholera Gabriel García Márquez Nan Hai Publishing Co.
8 14 9787544291163 2017-08 Journey Under the Midnight Sun (2017 Version) Higashino Keigo Nan Hai Publishing Co.
14 19 9787544285148 2016-10 Malice Higashino Keigo Nan Hai Publishing Co.
17 20 9787544267618 2014-06 The Devotion of Suspect X Higashino Keigo Nan Hai Publishing Co.
20 27 9787559620187 2018-10 Ran Freely Wu Zhe Beijing Union Publishing Co., Ltd.
21 28 9787544291224 2017-08 After School (2017 Version) Higashino Keigo Nan Hai Publishing Co.
9 21 9787535488473 2016-05 Walk Alone Freely Jia Pingwa Changjiang Literature & Art Press Co.,Ltd. 16 24 9787559620125 2018-05 Genius on the Left, Lunatic on the Right (Full Version)(New Edition) Gao Ming Beijing Union Publishing Co., Ltd.
20 29 9787550263932 2015-11 Genius on the Left, Lunatic on the Right (Full Version) Gao Ming Beijing Union Publishing Co., Ltd.
2 1 9787544270878 2014-04 Miracles of the Namiya General Store Higashino Keigo Japan Nan Hai Publishing Co.
8 4 9787544267618 2014-06 The Devotion of Suspect X Higashino Keigo Japan Nan Hai Publishing Co.
3 5 9787544291163 2017-08 Journey Under the Midnight Sun (2017 Version) Higashino Keigo Japan Nan Hai Publishing Co.
6 8 9787544277617 2015-06 Love in the Time of Cholera Gabriel García Márquez Colombia Nan Hai Publishing Co.
4 9 9787544291170 2017-08 One Hundred Years of Solitude (50th Anniversary Edition) Gabriel García Márquez Colombia Nan Hai Publishing Co.
7 10 9787544285148 2016-10 Malice Higashino Keigo Japan Nan Hai Publishing Co.
15 11 9787544281102 2016-01 Newcomer Higashino Keigo Japan Nan Hai Publishing Co.
11 14 9787544291224 2017-08 After School (2017 Version) Higashino Keigo Japan Nan Hai Publishing Co.
Not Ranked 16 9787544277723 2015-06 Tokio Higashino Keigo Japan Nan Hai Publishing Co.
Not Ranked 17 9787544258210 2017-10 Naoko Higashino Keigo Japan Nan Hai Publishing Co.
Not Ranked 19 9787544265591 2013-08 Snow Country Yasunari Kawabata Japan Nan Hai Publishing Co.
OpenBook is a privately owned industry-data research firm based in Beijing. It functions somewhat as Nielsen and NDP do from the West, and Nielsen Book Research International has worked with OpenBook in Asian operations. With authoritative data and information resources, OpenBook is able to deliver consulting service to partners who would like to explore the Chinese book market and identify suitable partners. Trajectory, based near Boston, is an importer of Western-language ebooks and audiobooks into China. Trajectory is also helping China’s largest publishers export their books and audiobooks through a proprietary global ebook distribution network that includes hundreds of retailers as well as library and school distributors. Trajectory recently has added copyright services, both for content going into China and for exports from China to the rest of the world. China has some 500 or more publishers in operation today. Most of them, Trajectory CEO James Bryant clarifies, are government-owned. Private publishers are required to purchase ISBNs for their titles from a publishing company that is government-owned—which, in other words, creates a system in which all ISBNs are in one way or another registered through government channels. The government approves each book published in China. More of China bestseller reports from Publishing Perspectives are here.